It’s a warm Saturday afternoon and we are counting down the hours until the start of the final day of wheeling. We left yesterday with very close action both on the Modified and the SuperModified sides of the series. Tied in first are Adam “Skinny” Lunn and Joel Randall with several other competitors’ right behind. It’s a perfectionist event this weekend. A cone is unacceptable and a reverse might take you out of the running. 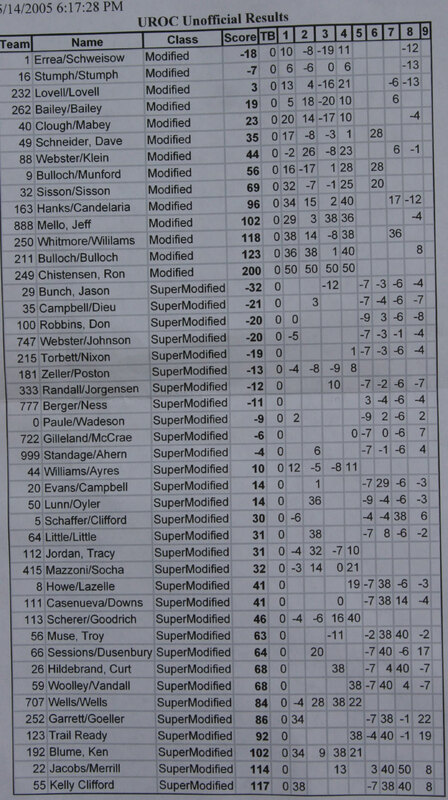 The Modifieds are a little different with Brian and Joachim continuing their finesse team work and being the only team in the negative on scores. Craig Stumph in his Maxxis tired rig is pulling in a close second and will be capitalizing on any mistakes that team #001 might make. We are excited to get this going and will be rolling out to the event site shortly. We will see you when the motors come to life. The Star Spangled Banner started everything off today and the rigs have come to life. We are off and crawling. As soon as the song ended, all I heard was a quick and loud release of air coming from Kelly Clifford’s rig. Before even laying a tire on the course, the an air switch for the lockers blew. So they had to bypass it and hard plumb up the CO2 really quick before the start. They got it going and Kelly, despite being a little nervous going first, is off and racing her heart out. Unfortunately though she gave it her best, the line blew again and she wound up timing out while trying to maneuver through to the end. Jeff Mello nearly pulled off an impressive save over on course #6. 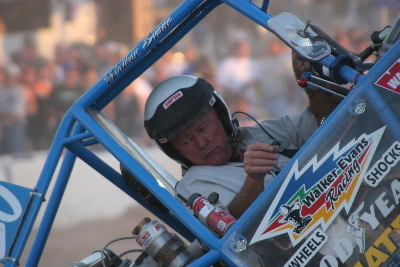 He was up top and all I could see from here was him working it hard in the cab to save his modified rig from going over. The rig literally walked down the hill on the wheels before it finally went too far and he succumbed to a sideways slam onto the dirt below. The crowd is out here in large packs and are braving the direct beating from the sun. We are all a little lobster looking after a couple days out here, so what is one more coat. 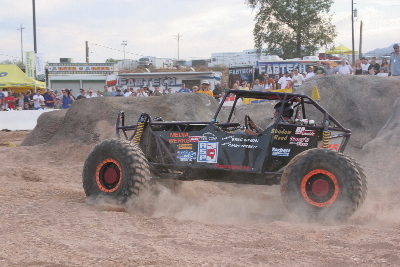 Shannon Campbell in the #35 crawler is ready to make it #2 at event #2. Taking the Salt Lake City event, he is eager to make it two in a row for the red team. On course #2 (there seems to be a # theme going on here), Shannon worked his buggy well and showed the Phoenix crowd why he is a top contender out here. We all know and love Shannon for his high horse power runs up and over obstacles, but he can also run the slow pedal just as well. Course #2 is a really up and down course with a side hill that has taken a few rigs out. It ends with a quick climb to the top of the hill with a massive center diff catching nub poised to stop anyone. Shannon made a leap up the hill like it wasn’t there and finished with only 3 points on the course. Skinny followed Shannon through the course and wound up not being able to finish. They were taking a lot of time on the off-camber section, but it appears that time wasn’t on their side. Skinny was at the bottom of the hill trying to make that nub climb when the clock ran out. He pushed it though because he nearly ended up rolling down the hill. He caught himself before he pushed it over and dropped back down. Skinny and Joel Randall were tied for first coming into today. Unless something drastic happens to the other competitors, this will almost for sure knock him out of the 1st place hunt. 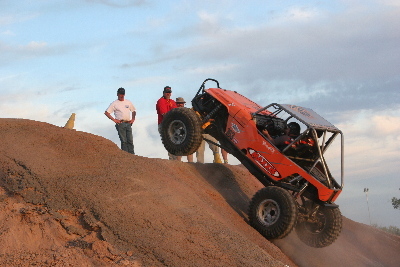 Mike Bailey in the #262 crawler is out having fun on these courses this weekend. We caught up with him as he was taking on course #7. As he was rolling through, there is a hill to crest over and a pit on the other side. At the bottom is a very difficult cone to get around. He tried his hardest to work his way around it burning off precious time from the clock. Despite the efforts, he slipped into the cone and raced to the finish. Regardless of the hit, he still did well with 6 points. Mike didn’t actually know his score when we asked him. He said he never cares what his scores are so that he doesn’t get his hopes up. He is just out enjoying it all and will get surprised in the end when he finds out how he did. He loves it out here this weekend and would only change the dust that seems to kick up pretty good. Bob Standage is an ANIMAL!! He just conquered course #2 with a vengeance. There is nothing like hearing the wind of his turbo as he lays a bead of rubber down on the ground while making a wicked climb. He finished with the crowd cheering on for the action. Pete Mazoni in #415 took himself over on #6 when he rolled into the big long crack. They have been trying to extract him for a while now because it is in the weirdest spot. There is just no easy way to get lines hooked up to him to get him out. It’s still wheels up and there are a lot of heads over there trying to unstick the fly from the fly trap. As you might remember, Tracy Jordan’s fiancée Heather is happy out there spotting. She had a hard time with the air cylinder yesterday, but has been doing well since. They are going to be doing a couple spotter rides for the next couple courses, but then she will be off to work again. She is really excited to continue the day and keep Tracy up in the points. I don’t think she will want to give up spotter duties after getting a taste of it. Just a quick update, Craig Stumph is only 1 point behind Brian and Joachim at this point. They are hunting each other hard. Ben Hanks just had a wild ride up #5. They launched up the hill at full throttle doing a spotter ride. They launched so hard that the front right tire came off the ground. He quickly cranked it back the other way and planted the tire back down. 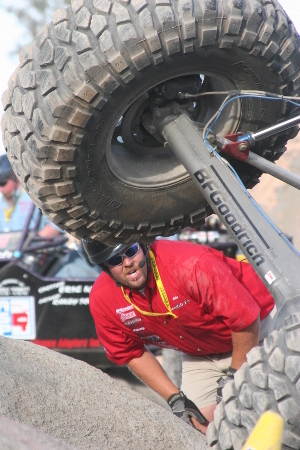 This wound up lifting up the other tire as he caught some air coming over the top. It was a crazy run up, but the crowd got into it. Ben is currently in 10 th place at this time. Walker Evans was just on course #3. He was running in about 10th place just a little bit ago. He was trying to make up some points to get back into the running, but he wound up timing out on the course which will hurt is overall finish. Walker concentrates hard to not bind up and break with all the extra traction of his red dot GoodYears. The night is encroaching upon the courses and the lights are starting to shine down so the crowd can continue to drool on. The crowd has been a big part of this event this weekend. The cheers can be heard by both driver and spotter and it seems to be making a difference for teams that thrive on it. One of the nice things we see are teams driving by the crowds and throwing T-shirts and Frisbees out to the fans. I swear I have seen at least 100 items thrown out to the spectators. It’s great to see the back and forth appreciation going on in this growing sport we so love. Nate Williams is on course #6 now and running clean. His new rig has one of the meanest sounds out here. You can really tell when he gets on the throttle and forces his #44 rig over obstacles. They geared up nd ran through the course and were able to pull a nice -6 points. Course #6 is such a harsh course. There have been countless teams who have had a hard time getting through it. So what is making this course so hard? It’s hard to describe without seeing it in person, but let me describe. To start things off, you have to crest over the top of a belly dragging hill then into a tunnel. That’s right… I said, a tunnel. It’s definitely a unique change in courses. Following the tunnel is a long wide crack crossing which takes you immediately into a double/triple whammy of sorts. Its trying to get across this off-camber crack line and up the whammy in good form that is taking so many people out. What tends to happen is a tire finds its way into the air and up on over they go. This is only half the course. Once you are past this tough section though, it is nearly smooth sailing there on out. There is one tough sideways hole that you need to dig around, but I have yet to see anyone struggle through it. Dustin Webster, who used to be into diving off of cliffs, is now turned the table and is now climbing up cliffs. Dustin took the new Red Bull rig up course #2 with one thing in mind. All the way no matter what it takes. Time must have been running close because as he worked his way to the bottom and prepped for the last climb, he was twisting steering levers and wheels all around and going full throttle to get up the hill. He squirmed up to the top to finish out the course with a -5 points. This pushed him up a little in points all the way into 5th position. Peter Wells in the #707 rig is having a much better day today than yesterday. Yesterday his scorecard was filled with high points that ruined any chances of making the podium. However, today he is on a high with course after course of great scores. Although he had it rough yesterday, today he is having a great time and making the rig work well. Peter Wells is smiling for all the great runs he has had today. It is getting exciting towards the end here. Zeller is currently finished and in second place. Shannon Campbell still has 2 to go and is in the lead. Just behind Zeller is the man from the east, Randy Torbett. He too has a few courses to go. Anything can happen especially since this isn’t the final. They will take their points into the final bonus round where the top drivers will battle it out for the final victory here in Phoenix. Some new scores have been updated. You can see where we are at as the time as the night comes close to an end. The event is far from being at a stand still though. We still have vehicles pushing things till the end. Skinny in the #50 rig just went over onto his lid on course #4. Though he is out of the points, he is still pushing his crawler. There is a whole extraction team out here this weekend who are keeping really busy. Known as the Rock Rats, they are racing from course to course extracting the leftovers of rigs that have fallen to the twist of the 8 course layout. Ok, it only took about ½ an hour, but Dean Bulloch proved without a doubt, that course #5, the wall, could be climbed just by crawling alone. He basically did a spotter ride and put it in low low and just walked his way up. It took a few attempts that were slow going, but he finally crested the top in what may have been the slowest run of the night. Great job to Dean and Karl in returning to the roots of the sport with their climb. I was able to make a run to the rest room in between the time you started and the time you finished. I needed the break. Jeff Mello broke the ram off of RJ Brown’s borrowed rig on the last obstacle. There is nothing like borrowing someone else’s rig then breaking it in for them. 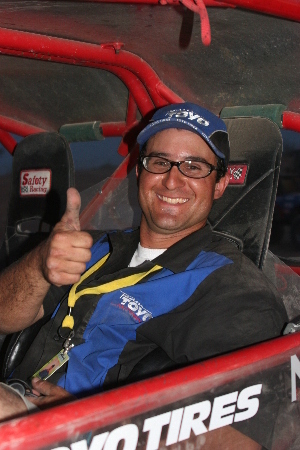 Jeff pushed the truck hard this weekend and gave everyone a few awesome displays of driving. Dave Schneider was on course #5 trying to do the climb for fun like Dean Bulloch. He was able to make it all the way to the top of the hill, but couldn’t crest over the top. It was all for fun though and wasn’t part of the regular run. There are only a few rigs left going, so we should have the finals starting up in a short bit. We will see you then . For the finals, there will only be the top 6 rigs able to compete. It appears that with Dustin not finishing his last course, Joel Randall may step into the last position in the finals. That leaves us with Campbell, Bunch, Zeller, Torbett, and Williams joining him. However, it might be Standage instead of Randall. We won’t really know until their final scores get posted. For the mods it will be Errea, Stumph, Lovell, Bailey, Clough, and Webster. While the last couple rigs run, several people have been making the attempt at the fastest to the top challenge on course #5. There is a 500 dollar pot up for grabs to see who can make it up the fastest. Some have smoked the hill while others wound up breaking enough to put them on the trailer. I saw some major sparks shooting out the back of Peter Well’s rig as he crested the top of the hill. We will be taking an intermission while the courses are set up for the finals. See you back in a few. On the Modified class, Becca was first out with Rich and they took some smart lines to sacrifice points in favor of getting through the course. They nearly finished, but were 2 seconds from crossing the finish line. The next 4 drivers didn’t make it nearly as far, so this pushed Becca into 3rd place. Craig Stumph was actually pretty close to finishing also, but didn’t get the chance. He still made enough progress to finish in second. In first, Brian and Joachim showed why they led this weekend. They walked the course and were pretty much flawless. They finished with time still on the clock. They actually had enough points to where they didn’t need to run, but what fun would that be. In Super Mods, the course was brutal. Two major belly dragging climbs stopped most competitors until Randy Torbett was able to walk around the first cone and up and over the next two walls to a screaming finish. Bruce Zeller followed up that run with another amazing crawl with Scrapper. He took it through where it seemed only a rear steer rig could get to. He put Shannon’s hopes of winning on the fence. Shannon had to come up with at most, 15 points to beat out Bruce. Shannon hit a cone right off the bat which took him pretty close. Several back ups eventually knocked his score to 17 which put him just a couple points behind the #181 Zeller rig. Zeller took the finish away from Shannon by just a marginal point spread. This was definitely some great racing. Thanks again goes out to Randy's Ring and Pinion for stepping up and sponsoring the UROC coverage for Pirate4x4.com at this event. Without quality sponsors like Randy's Ring and Pinion, we couldn't bring you the details that keeps you in touch with the rock racing season. We will see you at the next event in St. George for round #3.